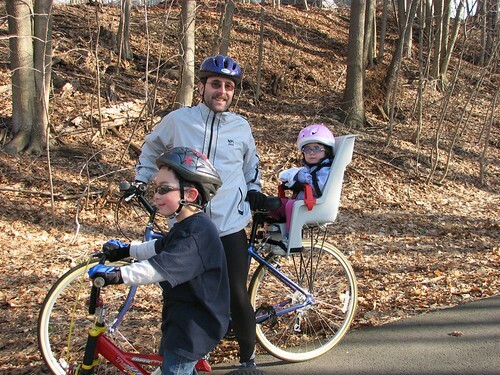 Speaking of biking, the weekend after we last went skiing, it was super warm and we took a bike ride as a family on the Nashua River Rail Trail. Adam has been riding a bike without training wheels since he was 4 and it was great that he could ride by himself. The only thing with those small bike wheels (these are 14") is that he has to pedal about 5 times for each of our strokes. Now, he needs a bigger bike (is there no end to this spending?)! So really, we went pretty slow, but managed to go about 2 miles. There were still snow patches on the trail but it was still beautiful along the river (this is not my picture, but it really did look like this!). I'm not sure what Geocaching has to do with the Rail Trail....except that it is a nice place to go after in the winter because it isn't so far off the beaten path.